I love this fabulous Supreme Pizza Casserole. It is absolutely mouthwatering and one you’ll droll over! This Italian recipe combines fettuccine, spaghetti sauce, pepperoni, and lots of cheese — both Mozzarella and Parmesan. 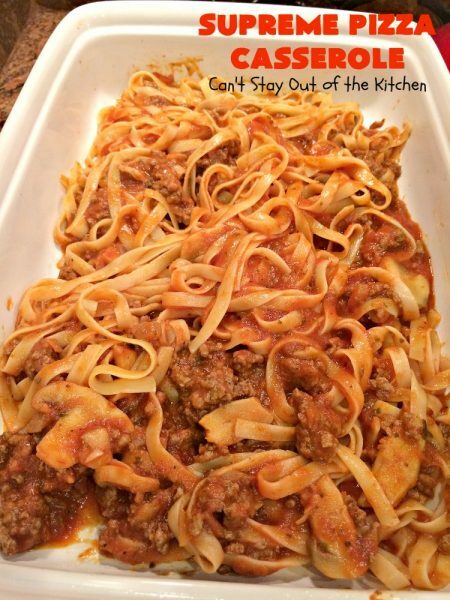 It’s fairly simple to put this main dish together and is a recipe that is kid-friendly, and one you can easily divide and put half in another dish for the freezer. Supreme Pizza Casserole is very similar to my Cavatini and my sister’s Pizza Hot Dish (not posted yet). This very tasty Italian main dish casserole is from Taste of Home’s casseroles cookbook, fall 2008, pg. 3. I love picking up Taste of Home booklets and paperback cookbooks to keep around the house in magazine racks. Then when I have time I can peruse them for another great find. Well this is one of them. 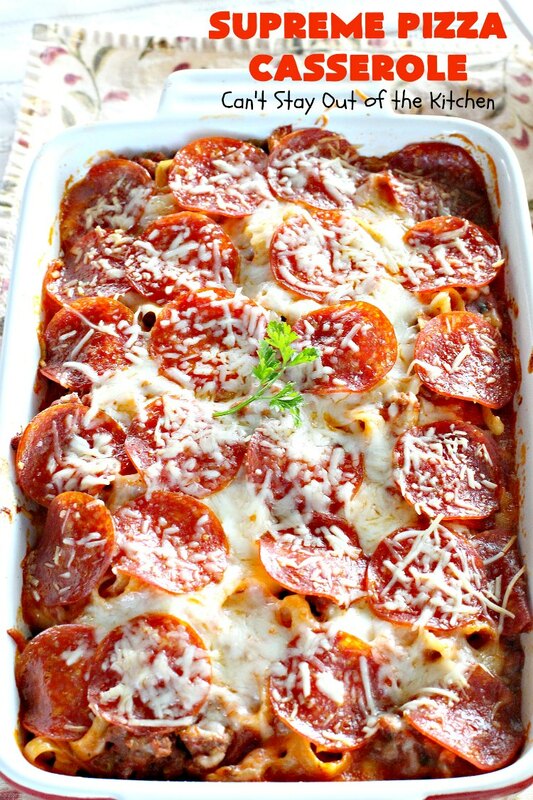 Supreme Pizza Casserole is the B-E-S-T! 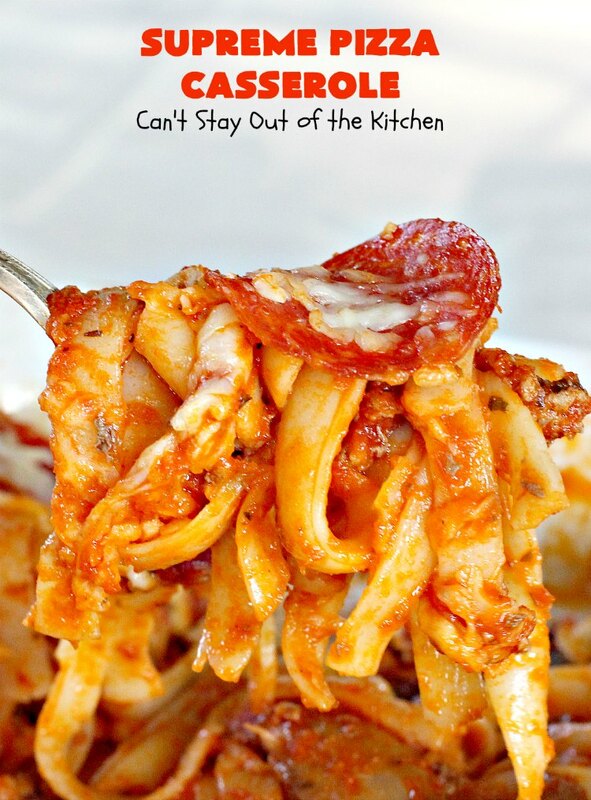 When I first posted this recipe in June 2012, I was just getting my blog off the ground. When I remade this recipe and took pictures in February 2013 the pictures were were taken with an inferior camera and late at night so they turned out dark, grainy, and without much definition. I recently remade this recipe for a party we had at our house for Labor Day weekend (September 2014), so I retook the pictures. 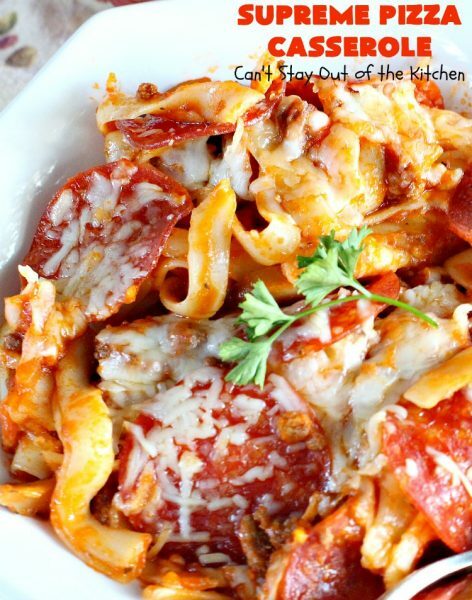 I think you will be better able to see how delicious this amazing pasta dish really is. 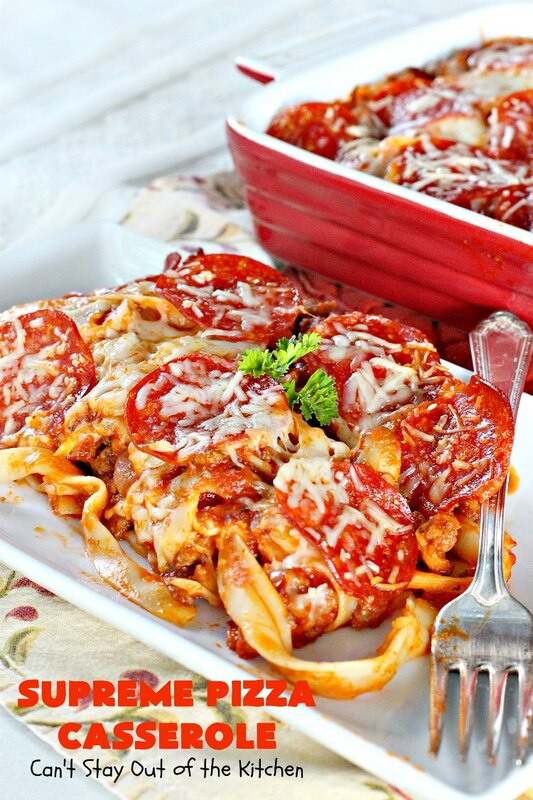 This Italian main dish is one you will surely want to add to your collection. 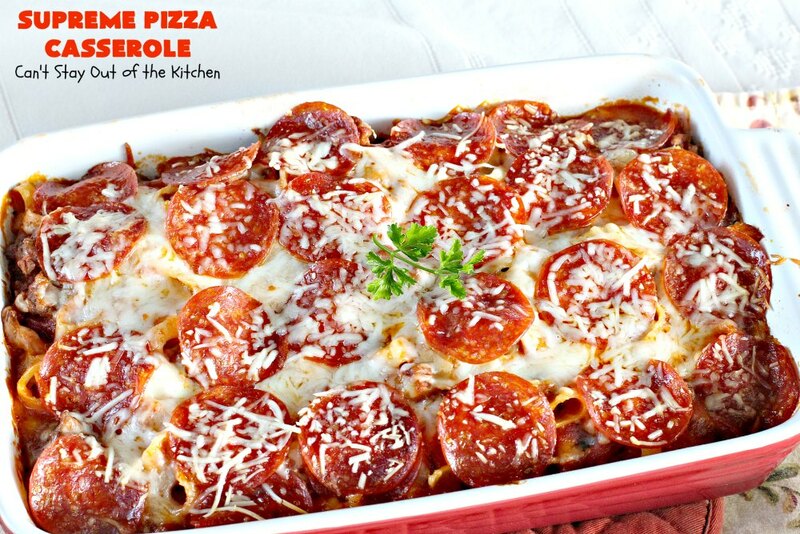 Your family, especially kids, will love this casserole that’s have way between pizza and pasta! It’s great for potlucks, family get-togethers and even as an alternative during the holiday season to turkey or ham! 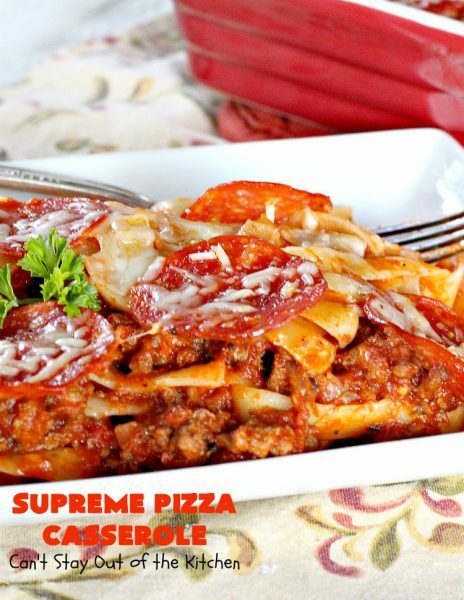 Supreme Pizza Casserole is tasty comfort food at its best. Pepperoni, spaghetti sauce, fettuccini, and cheese–what more could you want? Supreme Pizza Casserole has it all! 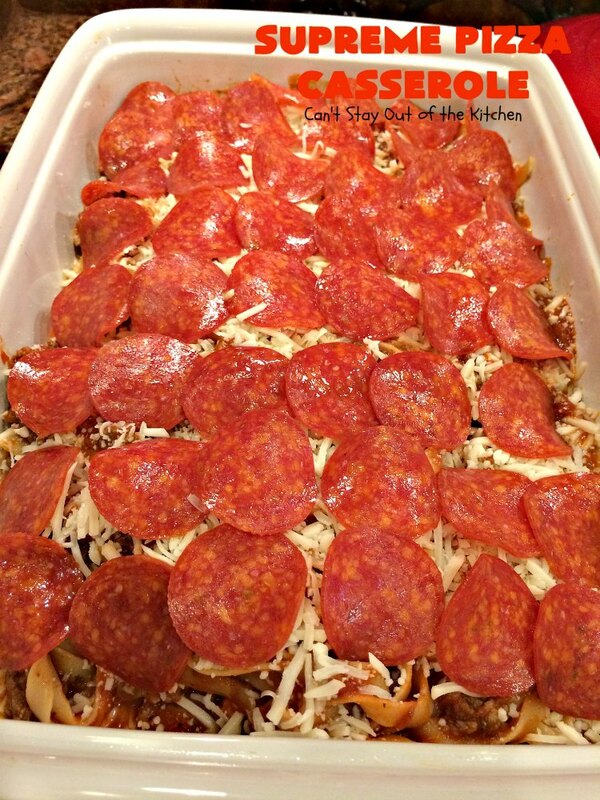 Prepare to drool over this mouthwatering casserole! 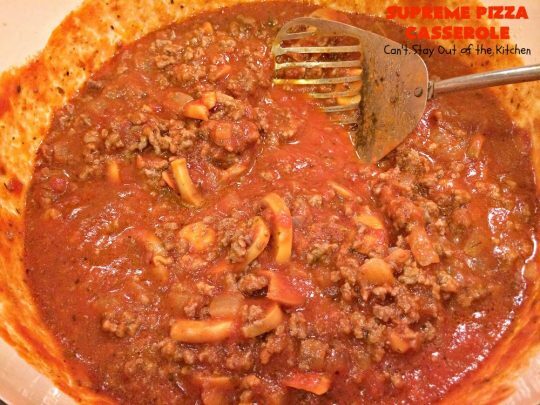 Add mushrooms, pizza sauce and spaghetti sauce to drained beef mixture. Add oregano, onion powder, garlic powder and sugar. Add cooked, drained fettuccini to spaghetti sauce mixture. Spray 10×15″ baking dish with cooking spray. Place half of the casserole mixture into prepared dish. Top with pepperoni slices. Then repeat layers once. After repeating layers, sprinkle parmesan cheese over top of the pepperoni. Cover and bake at 350 for about an hour. Remove foil. Bake an additional 10 minutes to melt cheese. 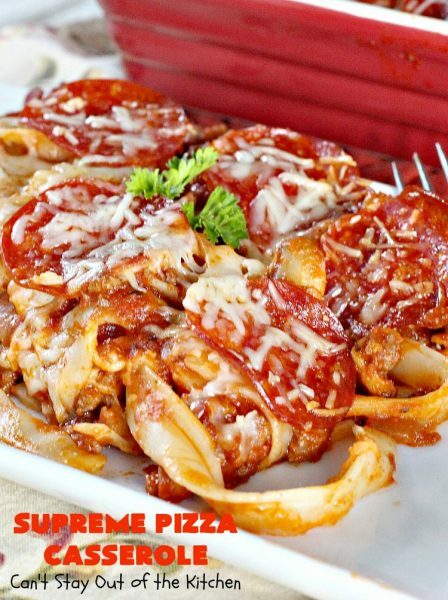 Supreme Pizza Casserole has an incredible pizza flavor with all the sauce, cheese and pepperoni included. Every bite of Supreme Pizza Casserole is wonderful. This amazing casserole is half pasta and half pizza! It's filled with beef, spaghetti sauce, pepperoni, fettuccini, mozzarella and parmesan cheeses. It's kid friendly and an entree everyone always enjoys! Meanwhile, in a Dutch oven, cook beef and onion over medium heat until meat is no longer pink; drain. Stir in the mushrooms and spaghetti sauce, pizza sauce, sugar and seasonings. Drain pasta; stir into meat sauce. Place half of the meat/pasta mixture into greased 10x15" casserole dish. Sprinkle 1 package of mozzarella cheese over sauce mixture. Layer 1 package of pepperoni slices on top. Sprinkle Parmesan cheese over top of pepperoni. 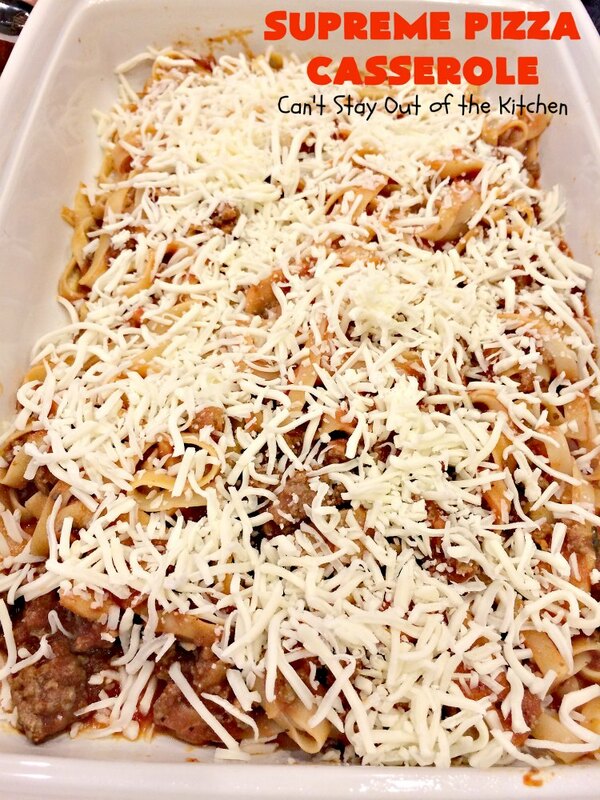 Cover casserole with foil or lid and bake about 1 hour at 350° until mixture bubbles on sides. Remove cover and bake an additional 10 minutes or so until done. 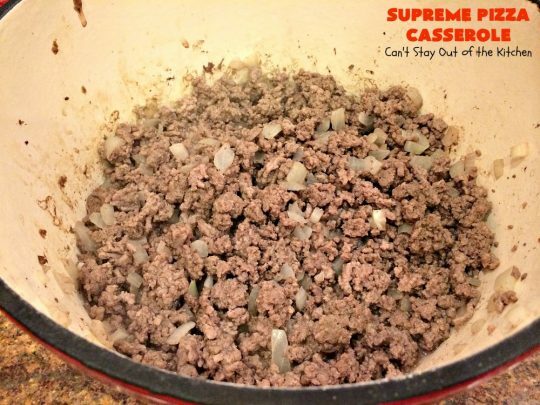 NOTE: You can also place this mixture in two smaller casseroles. Bake one and freeze the other. Cut cooking time down to about 45 minutes total. 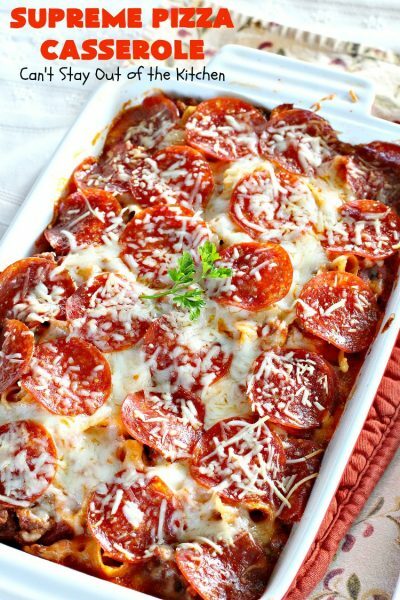 This amazing casserole is half pasta and half pizza! This one is filled with beef, spaghetti sauce, pepperoni, fettuccini, mozzarella and parmesan cheeses. Place half of the meat/pasta mixture into greased 10×15″ casserole dish. You can also place this mixture in two smaller casseroles. Bake one and freeze the other. Cut cooking time down to about 45 minutes total. 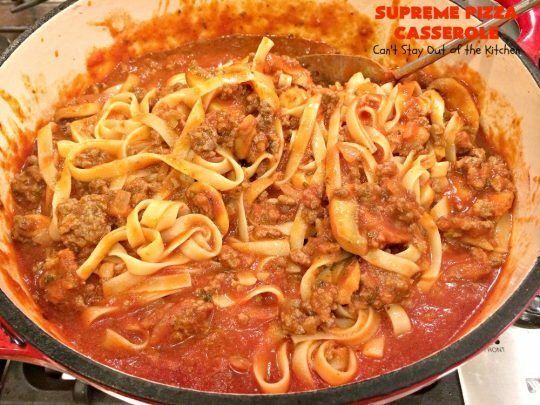 Supreme Pizza Casserole is a great pasta dish for company. 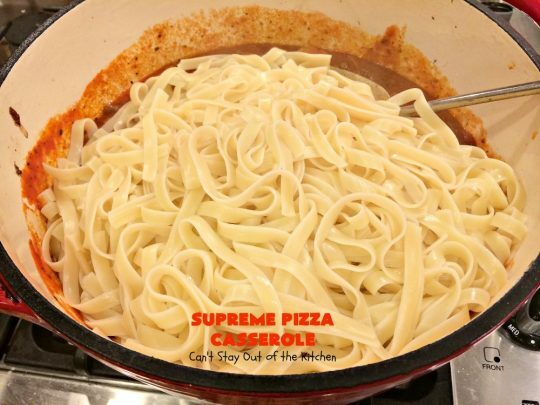 Our family has always enjoyed Supreme Pizza Casserole. I believe you will enjoy this kid-friendly dish, too. If you enjoy pizza you’ll love it in pasta form! 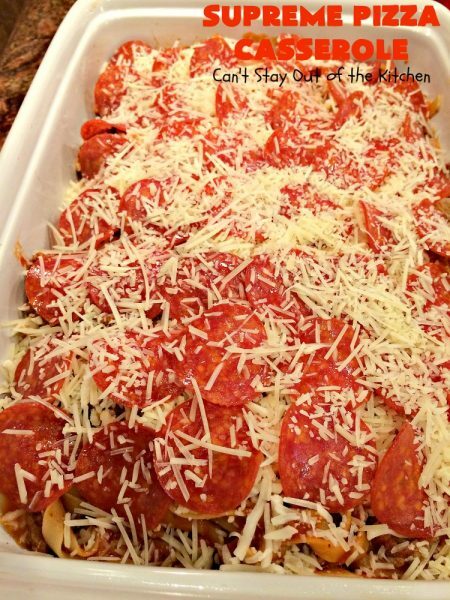 Help…I’m in the middle of making this and do not see where the pizza sauce is addressed except in the ingredients list. Where do I put it? Hi, Mary. I’m sorry, the pizza sauce is added at the same time as the spaghetti sauce. I’ve corrected the post. Thanks for catching this. Served it to 24 quilters today and they all loved it. Several even asked for copies of the recipe. Thanks for the fabulous recipe. Kudos to you. Thank you so much, Mary. I really appreciate you letting me know how much you liked it. This recipe is a keeper! This sounds incredibly delicious, but I’m very concerned about the sodium content of this dish! 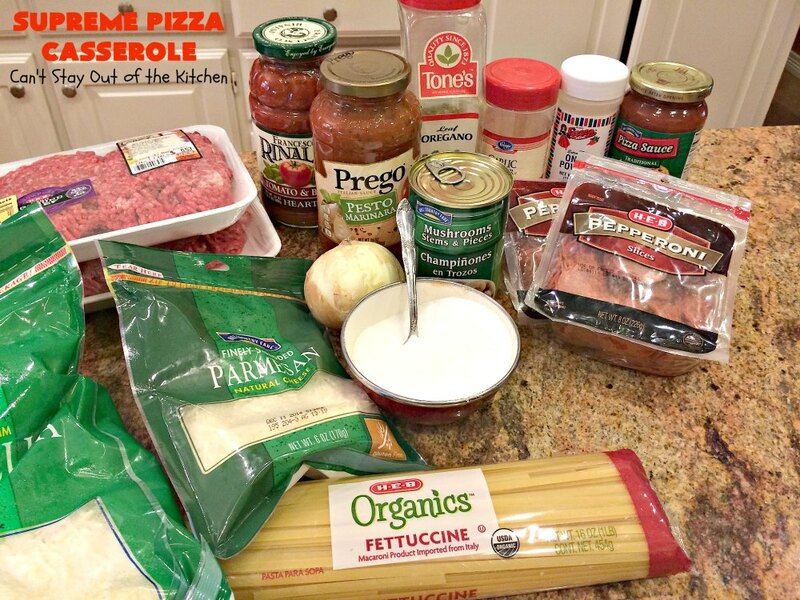 By using spaghetti sauce & the pizza sauce (from jars), Mozzarella & Parmesan cheese, and also Pepperoni…. these additions are all extremely high in sodium! What is the Nutritional Value of this dish (per serving)…. since some folks don’t know how to figure it out, but need to follow a lower sodium diet. Please advise. Hi, Angelina. 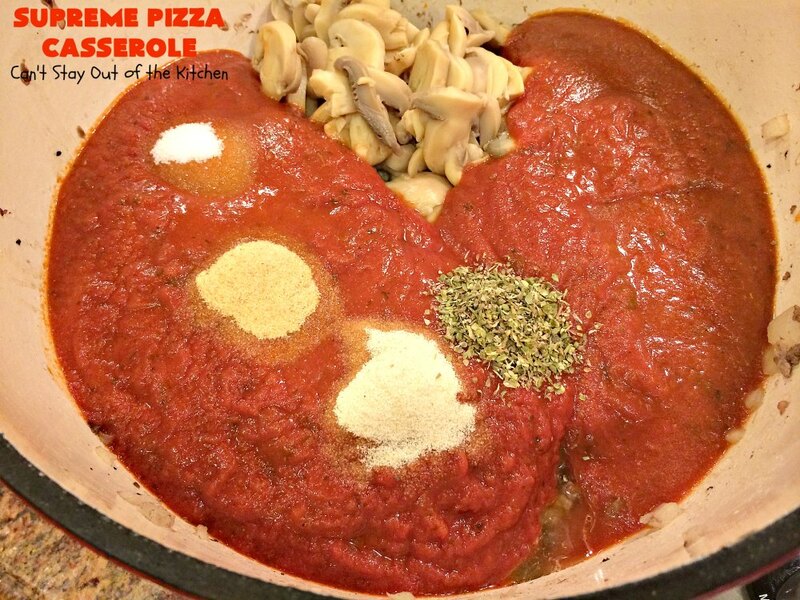 The only thing I can recommend if you wanted to try this recipe is to find a low-sodium spaghetti sauce or make your own sauce from scratch. Nutritional value can be determined by finding an online website that calculates ingredients. Thanks for stopping by.